In the 7 months we’ve had our french bulldog, Guinness, he has pooped on Dad’s bass guitar case, peed on Dad’s brand new cell phone, but the Pièce de résistance was this morning when he chewed a hole in Moms wedding dress. 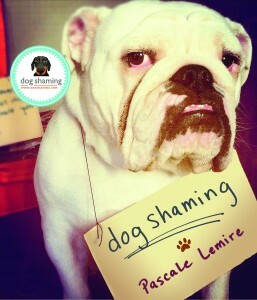 Enough is enough, he needed to be shamed. 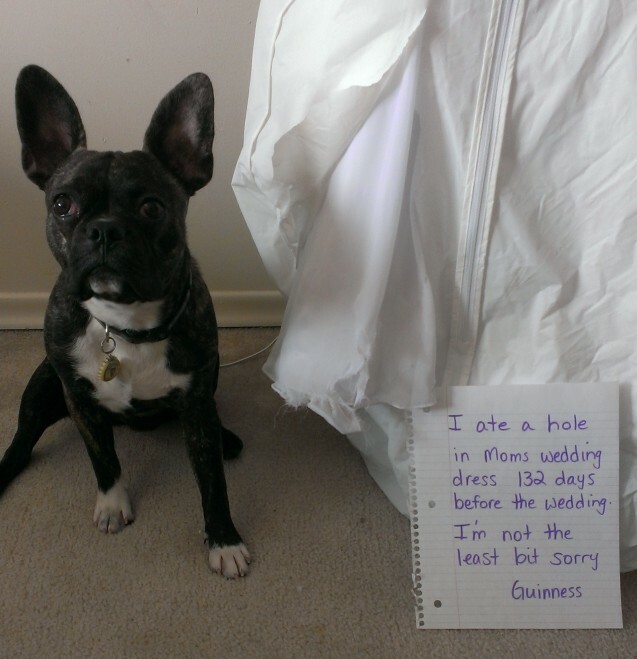 Editor’s note: I got in contact with Devan, Guinness’ dog-mom, and she’s happy to report that the dress was repaired fairly quickly and the wedding went off without a hitch, Guinness was even forgiven and allowed to be part of the ceremony! Devan looked absolutely gorgeous! Congrats to the happy couple (and Guinness!). Posted September 22nd, 2013 . This is why my dress stayed at the shop until 2 days before! Congrats! Mornl of the story: keep wedding dresses in CLOSED closets. Maybe he doesn’t know where he fits now. Two Alphas and what’s or who’s left? The dog whisperer has a website. I think you might even get some info on “my Cat from hell” show. Its all about packs, families, who’s who at home.In his little dog mind he may be displaying not his dislike but his confusion and please unconfuse me. Maybe check the internet for an answer. Glad he got to be in the wedding. With his coloring, he looks like he is a bow tie away from wearing a tux. Hey, the dress had the Frenchie stamp of approval!